My wife and I were about to head home parked in Valencia, when she noticed these lights in formation above the San Francisco Mission District. I wasn’t sure if at first if it was another Tequila hazed mirage, but myself and a few bi-standars where all in complete awe at the lights we saw on Valencia. Please excuse my drunken reaction. This was the first time I ever saw something like this. There’s also a yellow speck which is from my iPhone lens but it’s clear which lights I’m referring to. At first glance, I thought it might be fireworks but when they started to form a triangular formation, I knew this was uncommon. You folks be the judge. My final conclusion….UFO’s are here for Papalote salsa. Any three things in space ALWAYS form a triangle. even if they’re in a dead straight line? Three points that are all collinear cannot make a triangle. was walking towards Valencia from Shotwell’s on Saturday night around midnight and saw this as well I believe — it looked like 6-8 candles tied together floating above the Mission. they were flickering and at least 1 went out when we were watching, which is what makes me think they are candles. I’m assuming this is Hanukkah-related, you may want to tag this post as such. So you’re saying the aliens are Jewish? I went out in the Mission for my birthday that night and don’t remember anything from 1AM on and woke up at a house in North Beach the next morning, so those were definitely aliens. looks like those candle lanterns people let go at weddings. Saw this from my balcony in the Castro, there were at least 7 bright orange lights in crazy formations and they did disappear suddenly, each at a different time and different location, they did not look like candles, they were high in the sky. I had to grab my roommate to witness it. I live in SE Ohio, and I saw the same thing last night. There were three soft glowing orange lights that formed a triangle and then in a straight line traveling east. They were closer than in this picture and larger. There was no sound. I called my son on my cell phone to step outside and see if he could tell what they were. There were no airplanes, helicopters, and no way were they “candles.” One of them started going a little faster in the line and disappeared. The other two continued in the same line heading east, flew closer together, then also disappeared. I forgot to ask – what part of the US did you see these in. I am in SE Ohio. It looks like this video was from California. It was around 6:12pm when I tried to take the picture. Please see my note above to Andrea. I saw them here in SE Ohio, too. It was before 7:00pm. I’ll have to ask my son to check the time he took pictures. What part of the US were you in when you saw them and what time? I saw this video because a friend posted it to me on facebook after I asked if anyone else saw them and knew what they were. My first reaction was UFO. There’s only one Mission, and it’s not in a flyover state. not true, we have 21 in California. They were Loy Kratong lanterns put up a couple of weeks late. Thanks fopr wasting my time with your crappy video. Hella people have been talking about this. Must mean it’s legit. I have submitted this video to SETI, and they have confirmed that the lights were alien spacecraft scouting the Mission for the best reverse happy hour. It’s the TacoCopter making a delivery. Are you all too young to have seen History of the World Part II? Clearly these were Jews in Space celebrating Chanukah. Mazeltov, you tiny green space men! Which direction is the cameraman facing on Valencia? I saw odd moving lights from the biggest hill in Point Richmond (East Bay) somewhere over Presidio area and the Bay very late last night but brushed it off. Then I saw this link on Drudge. Strange! I had an almost identical experience at about 11:15 Sunday night while driving down Dolores. 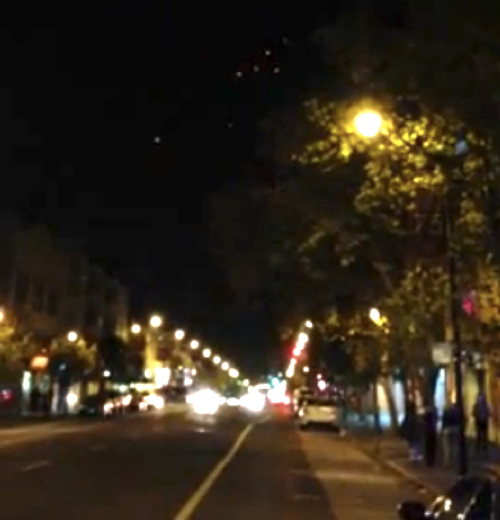 There were 5 or 6 very bright orange lights that were hovering above the Castro. At each red light I looked over in disbelief to find they were still there. Suddenly two of them started moving towards each other. One moved extremely slowly, while the other moved extremely fast. The stoplight turned green, I drove a block and reached my destination, and they were obscured by buildings. I was so confused I didn’t even pull over to get a better look. I’ve been weirded out ever since. maybe they’re holograms created by the govt. to make us believe they’re aliens. First guess: Airplanes at different distances from where they were seen, so they appeared to be in a formation. I’ve often seen aircraft over the Bay that have shown similar behavior as apparent clusters of lights even though they are entirely separate & unrelated to each other. Second guess: Some kind of reflective mylar balloons that were released from a party and drifted. This turned out to be the explanation for a similar daytime UFO sighting in Manhattan. At night, balloons of that kind can pick up light from the ground, and the slightly orange color of street lighting would account for the orange appearance as they floated up to a cloud layer and disappeared into the clouds. However, it’s always good for people to take photos and videos of unusual objects in the sky. If the object is an aircraft in distress and heading for a crash, your photos/videos could help figure out what happened. If the object is a meteor, your photos/videos could help scientists who track meteors, and if it strikes the Earth, could help to locate it so it can be analyzed. And there’s always the slim possibility that one of these things (or a cluster of them, as the case may be) could turn out to be extraterrestrial technology, for example robotic probes similar to the ones we have launched into the solar system. A civilization that has solved its sustainability problems and is planning for the long term, could afford the cost and would have the time to launch large numbers of robotic devices to other star systems, at speeds in the range of a single-digit percentage of light speed. Hundreds or thousands of years later, their descendants would be around to pick up the scientific data relayed home by the devices. Think of it this way: If we (humans) could deal with the climate crisis and the various petty conflicts that waste so much of our time and efforts, what would we do? We’d solve our human problems such as poverty and hunger, and we’d turn our attention toward global efforts to answer the big science questions. One of the things we’d likely do is start launching more robotic space missions. Eventually we’d launch interstellar probes to some of the star systems where even today we are finding planets that are likely to have life on them. Now fast-forward a few thousand years and imagine your distant descendants being able to receive scientific data from planets in other star systems. Imagine them receiving data showing life on other worlds, whether it’s extensive plant cover, or whether it’s evidence of other technologically capable civilizations (e.g. light seen on the dark side of a planet). What an amazing thing to have bequeathed to those who come after us, right? They would look back and thank us for having given that to them. As it is, our distant descendants will look back on us as having left them a world with a climate crisis that they would have had to solve: that we had the party and left them the mess to clean up. That’s not cool, and it’s not fair. So if you look up in the sky and see some puzzling objects, ask yourself: what kind of world do we want to leave to our children’s children’s children (etc.) a couple of thousand years down the line? A world where they inherit a space program that helps understand important questions about life in the universe? Or a world where they inherit a nasty rotten mess of damaged ecosystems and crises that could have been prevented? That’s the real lesson here. What we do today, makes or breaks the world for those who come after us.